If we read the financial pages, economic growth seems to be viewed as the “normal” situation to which economies inevitably return. But is it really? Let’s think about this a little further. We live on an earth with a fixed surface area. 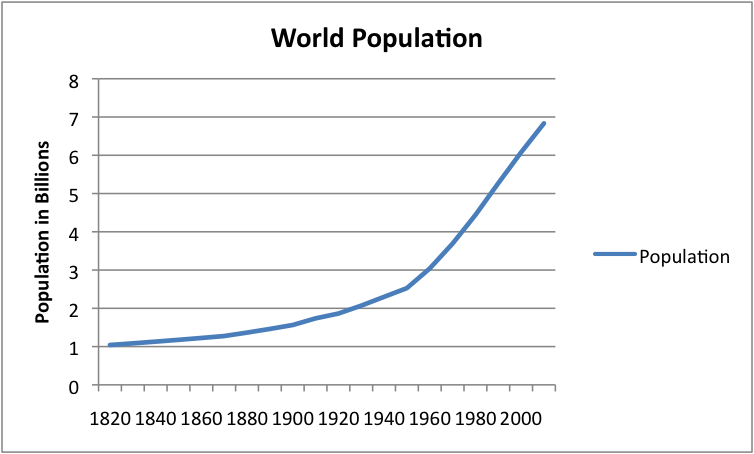 If the population of the earth keeps growing, at some point people would fill up every square foot (or square meter) of land space. Clearly that can’t happen. Also, the resources we pull from the ground aren’t unlimited–at some point the amount we pull from the ground starts to deplete. We know that at some point, perhaps far in the future, economic growth must stop. The question is really where we are now, relative to the hard limits that we know must exist. Let’s think about the situation. 1. Human ingenuity. Animals don’t provide goods and services; humans do. Human ingenuity is needed to think of ways of combining materials and energy of various forms to provide goods and services. 2. Materials. Goods and services don’t come from thin air. Even if the product in question is a service, materials of various types are likely to be needed–a place for the worker to work, perhaps heated and cooled; a computer for the worker; transportation to and from work; and food for the worker. If food is to be produced, the soil must be of good quality, appropriate minerals must be in the soil, and fresh water must come at appropriate times. 3. Energy sources. “Work,” typically involving some type of movement or heat, has to be performed to make the service or goods appear. This work is performed by some combination of humans, animals and machines. A human worker needs food as an energy source so he can perform the work of typing on computer keys. Similarly, in parts of the world where draft animals perform work, they need food as their energy sources. Machines operate with various kinds of energy inputs. If electricity is used, it can be generated in many different ways. Other forms of energy include fossil fuels (coal, natural gas, and oil), wood burned as fuel, wind energy, solar energy, nuclear energy, water energy, ethanol and other biofuels, and geothermal energy. In the Neolithic period, starting about 7,000 BC, early farmers were able to increase the amount of food available per acre by shifting from being hunter-gatherers, and thus support a larger world population. This was not entirely an advance, however. Hunters and gatherers were running into limits because they had killed off some of the game species. 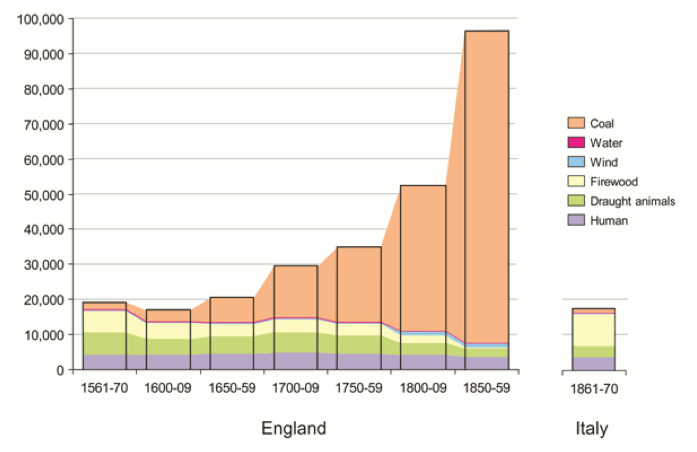 While agriculture allowed a larger population, the health of individual members was much worse. Average height of men dropped by 6.2 inches, and the median life span of men dropped from 35.4 years to 33.1 years, according to Spencer Wells in Pandora’s Seed: The Unforeseen Cost of Civilization. Wars are also tied to lack of resources, energy or otherwise. Plunder in itself was often a major objective for medieval wars. Charles Hall and Kent Klitgaard in Energy and the Wealth of Nations talk about Japan’s need for resources, particularly oil, being a major reason for it role in World War II. According to Ugo Bardi, Italy’s lack of coal played a role in its involvement in the same war. Many have suggested that oil resources played a role in the United States’ involvement in Iraq. 1. Agriculture, starting about 7,000 BC, and later the Green Revolution. The invention of agriculture allowed world population to grow from something less than 100,000 hunter-gatherers world-wide, to about 225 million at the time of Christ. In a “settled” state, financial systems and trade developed. 3. The Development of Fossil Fuels (Coal, Oil and Natural Gas). As mentioned previously, environmental degradation was a huge problem from at least 3,000 BC onward, because wood could not provide enough energy for growing populations. Figure 1, below, shows even at a much later date, water power and wind power did not provide much energy either. 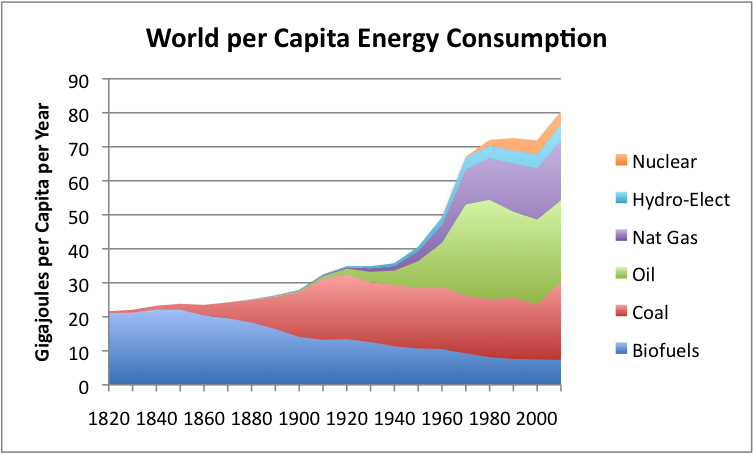 Because “renewables” did not provide enough energy for growing populations, other fuels were sought out. The industrial revolution transformed the productive power of societies. It did so by vastly increasing the individual productivity, thus delivering whole populations from poverty. In this new account by one of the world’s acknowledged authorities the central issue is not simply how the revolution began but still more why it did not quickly end. The answer lay in the use of a new source of energy. Pre-industrial societies had access only to very limited energy supplies. As long as mechanical energy came principally from human or animal muscle and heat energy from wood, the maximum attainable level of productivity was bound to be low. Exploitation of a new source of energy in the form of coal provided an escape route from the constraints of an organic economy but also brought novel dangers. Since this happened first in England, its experience has a special fascination, though other countries rapidly followed suit. After coal was discovered, the power of oil and natural gas were also discovered. Oil was in many ways superior to coal: it was a liquid, so it could be easily dispensed and easily transported in vehicles, it was more “energy-dense” than coal and natural gas, so the size of the tank could be smaller, and after oil was refined, it was cleaner burning than coal. It was more expensive than coal, but it quickly became the transportation fuel of choice. 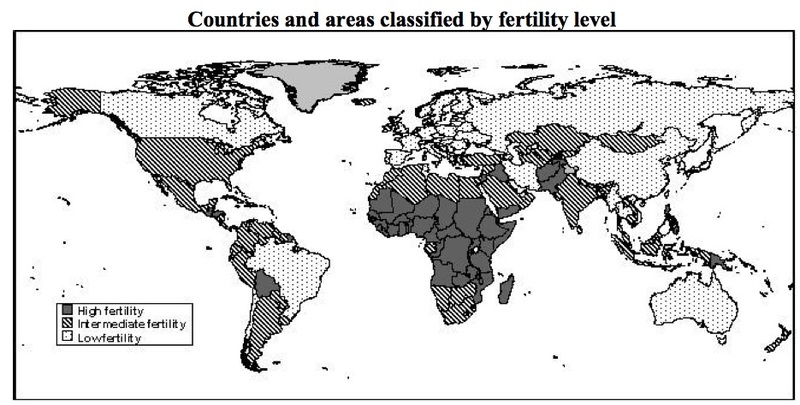 Use of coal, oil and natural gas led to huge economic and population growth (Figure 3). 4. More Education. Another force that helped enable long-term economic growth was a trend to greater education, since a better-educated population could better use new technology and would be able to handle more advanced jobs. As an example, during the first half of the 20th century, literacy rates in China were only 15% to 20%. Now, according to the CIA World Factbook, China’s literacy rate is 92%. The “Kick” to world economic growth that we had in the past will no longer be there, because the synergies of integration have now pretty much been reached. We are starting to see the down-side of an integrated world economy, such as downward pressure on wages, leading to demands for more separation. In future years, we may even see some “unwind” of an integrated world economy, resulting in less synergy. Another concern with an integrated world economy is that with a single world economy, it is harder to deal with degraded ecosystems. As mentioned previously, Sing Chew writes about some societies collapsing due to ecosystem distress in one part of the world, while other societies continue, allowing the ecological systems in that area to rest. If all of the world’s economies are now integrated, the collapse of one economy leads to a much greater chance of collapse of other economies, especially if financial systems are connected. After many years of extraction, what we have left is the lower quality, more expensive to extract resources. They may be deep underwater, or in countries with unstable political situations, or have serious pollution issues. 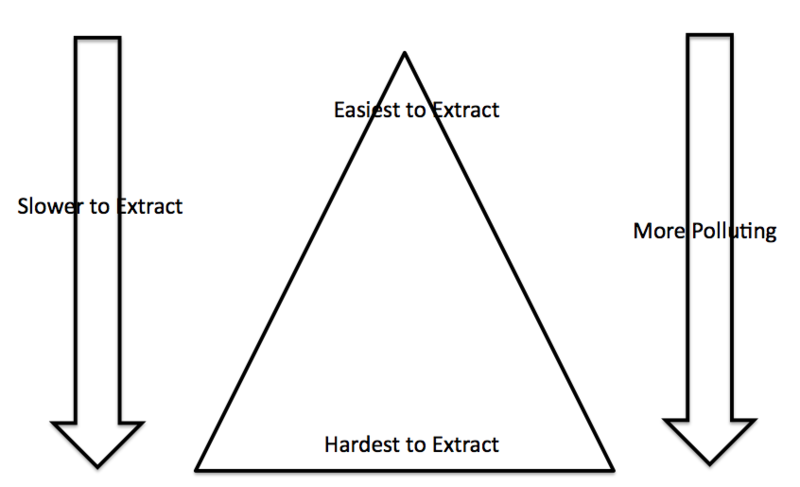 On Figure 6, it is as if we start at the top of the triangle with the best-quality resources, and work our way down. It always looks as though there are plenty of resources; they are simply of lower and lower quality, so no “alarm bells” go off. But things aren’t really all right, because we can’t get the oil out fast enough to meet rising world demand, and prices go up, leading to recession. The reason high oil prices tend to cause recession (which is declining economic growth) is because fuel for driving to work and food are necessities for most people. Oil is used to make gasoline, and to grow and transport food, so the prices of gasoline and food tend to rise when oil prices rise. If oil prices rise, consumers cut back on things they don’t have to have, like vacations and restaurant spending. This leads to layoffs affected industries, and possible recession. It might be noted that additional education is not necessarily helpful on very broad issues, such as “Should we expect the economy to grow forever?” One reason is that research tends to get very compartmentalized. Scholarly papers tend to be narrow in scope and very deep. Researchers are rarely good in economics and anthropology and geology and ecology at the same time. Therefore, their analyses tend to tackle only small pieces of the problem and miss the big picture. 5. Aggressive Use of Debt Financing. Aggressive use of debt financing has limits, too, because after some point, people and businesses and governments can’t afford to pay back the debt, especially if interest needs to be paid as well. 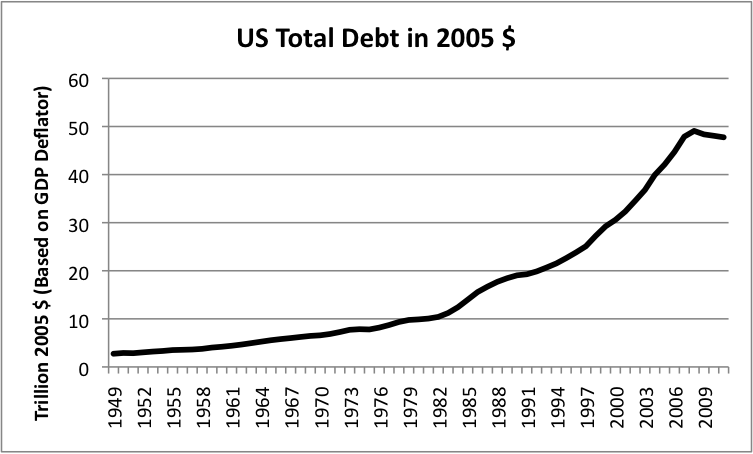 Figure 4, above, gave a hint that we are reaching limits, since amounts were no longer rising after 2008. 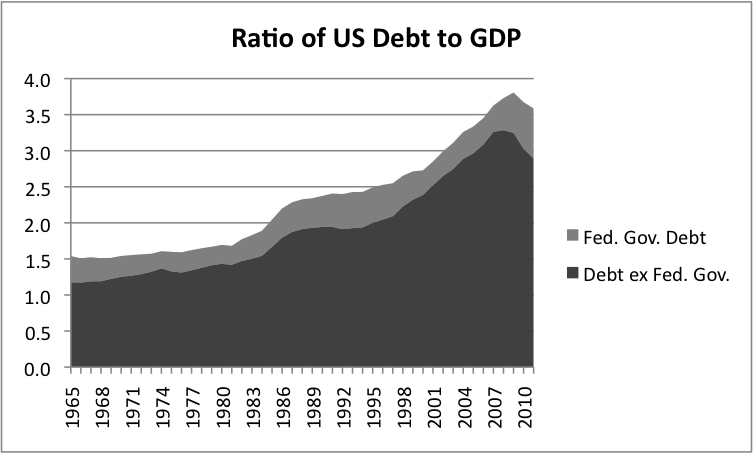 If we look at the split between debt by the US Federal Government and other debt (Figure 7), we see that since 2008, government debt has rapidly escalated, while other debt has been dropping as a percentage of GDP. The absolute level of debt is very high now, raising questions as to whether this approach to ramping up demand is sustainable. Real people can’t pay back debt if their salaries are not high enough, or if the value of their homes is declining. There are many potential “fixes” to shortages of fresh water, such as piping water from a distance (sometimes uphill), desalination, and treating wastewater so it can be used for drinking. All of these fixes require the use of energy in one form or another, and, as we have already seen, energy supplies are increasingly difficult to extract and often tied to carbon dioxide pollution. Also, if any of these fixes are tried, the price of water is raised. Since water is a necessity, this can lead to cutbacks in other expenditures, and thus recessionary influences. The issues with too high debt level suggest that 4. A way to pay for goods and services may also be at risk. This leaves only 1. Human Ingenuity to solve our problems. While humans are very ingenious, we can’t expect their ingenuity to keep an economy growing indefinitely, with the other three all under stress. Looking back at past history does not suggest simple fixes. Humans have had difficulty with sustainability since they were hunter-gatherers. “Renewables” have not proved to be very “scalable” in the past, suggesting that we may be expecting more than is reasonable of them now as well. Increased use of fossil fuels doesn’t appear to be a very good solution either, because of pollution issues. Scaling back the size of the economy is not easy either, because of the large number of additional people we expect to need to feed, and the fact that all of the infrastructure that is currently in place will tend to degrade, and therefore need repairs if it is to remain useful. This entry was posted in Book draft, Financial Implications and tagged collapse, economic growth, oil, oil price, recession. Bookmark the permalink. 124 Responses to Can we expect the economy to keep growing?